« Proof I recalled 1950s TV correctly! Why is the U.S.S. Independence in San Diego? There’s a piece by Spencer Ackerman in Wired Online in which he grouses because the two new Littoral Combat Ships, the USS Independence and USS Freedom, weren’t sent to Libya. They were designed for combat close to shore and are capable of operating in less than 20 feet of water. He does make the point that the Independence was just commissioned in January and the Freedom in 2008, and they are relatively untested; putting them in harm’s way when it is unnecessary is probably not warranted in what is supposed to be a 20-minute war. He doesn’t talk about some other issues. When we went to the commissioning of the USS Ronald Reagan, CVN-76, we found that it was being recrewed and then the actual workup would begin. There had been a crew on it for most of a year, but they now would move on, and the actual crew that would take it to sea for trials was coming on board. The complexity of a modern aircraft carrier is so great that it would take a year to get the bugs out of it before it would be ready to join the fleet as an active carrier. The Freedom (LCS 1) is a monohull design, built by Lockheed Martin in, of all places, Wisconsin. 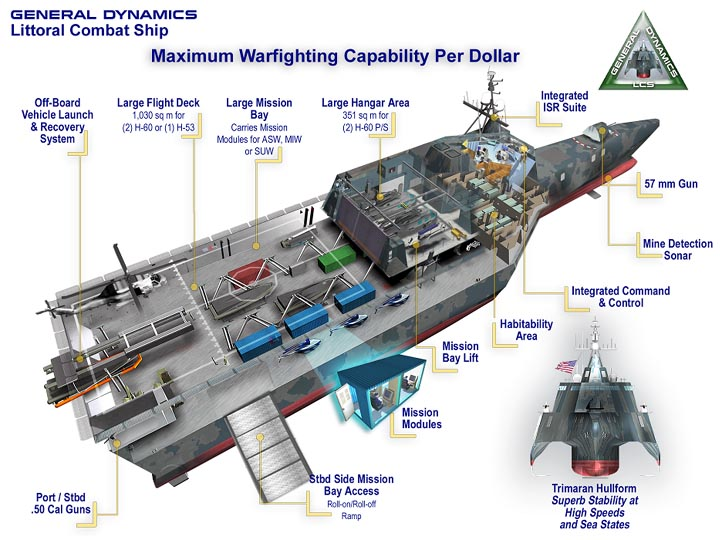 The Independence is built by General Dynamics and is a trimeran hull design, built in Mobile, Alabama. So, you can say they are the same and since one has been out since 2008 the other should be able to use the same procedures, but you would be wrong. The ships are radically different in design. They may fight similar missions, even side-by-side, but the crews will operate differently. 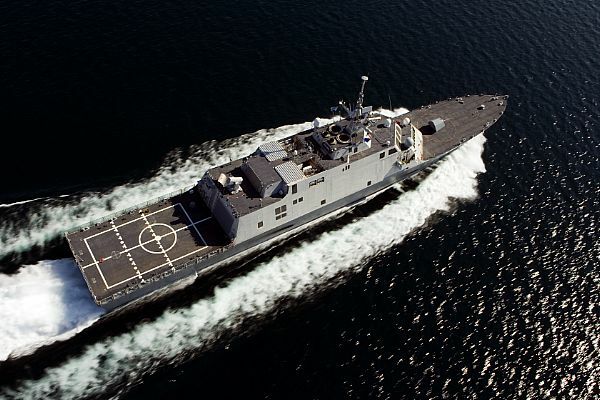 The LCS 1 design is said to be better at working with other ships, the LCS 2 design better with helicopters. They have been designed so that “mission modules” may be added – containers with specialized equipment for a particular mission. One possible mission for ships of this kind is drug interdiction or piracy patrol. They may even carry Marines. Two of each design were originally to be built for testing purposes, with subsequent ships to be based whichever design proved superior. To date, the Freedom has had a number of problems and has spent very little time in actual operations, while it has required significant repairs. 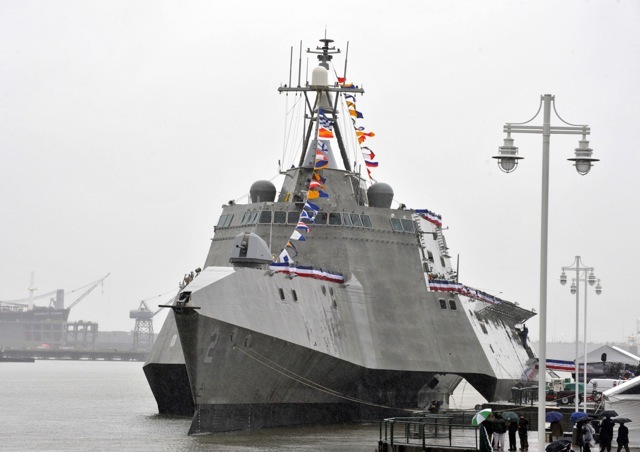 Cost overruns were high enough that it was decided not to build LCS 3 at all. 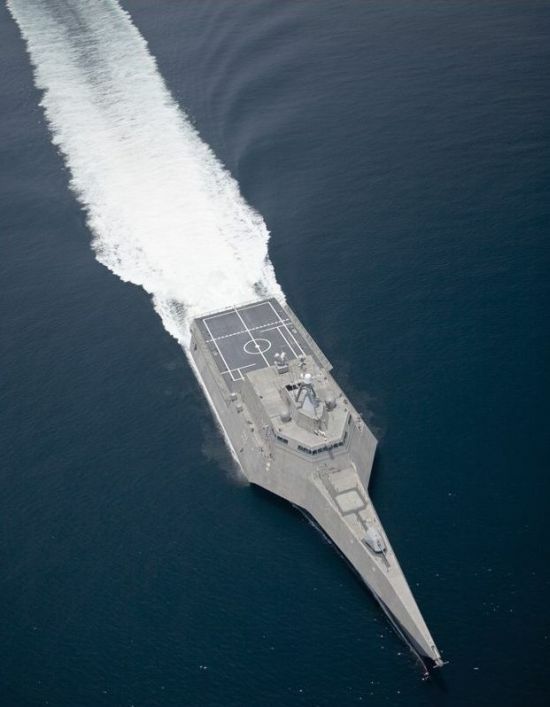 LCS 4, USS Coronado, is under construction and is scheduled for delivery in mid-2012. So there’s are several good reasons not to take these ships out to Libya. First, by the time they get there, they won’t be needed, if the President is right. (OK, that’s a stretch, I’ll admit it.) They are, after all, on the Pacific coast! Second, they aren’t tested enough to be effective alone, let alone integrated into the operations going on there. They’ve not been worked into missions with the rest of a carrier group yet, so they could be wasted, land possibly in danger, by hurrying things along. It seems good judgment prevailed in the US Navy on this one.